After Charlemagne died in 814 AD, his son Louis inherited the empire, and then Louis’s three sons divided his empire between them. One son took the west (mostly modern France), and one son took the east (mostly modern Germany) and one son took the middle (modern Switzerland and Belgium). The middle son didn’t last very long, before the other brothers killed him. Although there was a lot of fighting between the two brothers and their children and grandchildren, nobody really ever succeeded in putting together a large empire like Charlemagne’s again. They each ruled small parts of his empire. This was a lot like what happened to the empire of the Roman emperor Constantine, or the Merovingian king Clovis. The kings who held Germany kept Charlemagne’s title of Holy Roman Emperor until 924, when they died out. 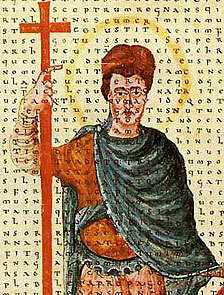 In France, the Carolingians held power until 987, when they, too, died out, and the Capetian dynasty replaced them. The middle part, between France and Germany, became the ground where France and Germany fought most of their wars, which is still true today. Cite this page: Carr, K.E. Carolingian Empire – Medieval History. Quatr.us Study Guides, August 2, 2017. Web. April 20, 2019.